Generally speaking, I fall into the “Cook’s Illustrated” school of thought, which is to say that I prefer to produce the ideal example of whatever item I happen to be cooking. (Though who wouldn’t?) But the difference between me and most home cooks is that I feel this preference as a keen need, rather than a simple want. I am rarely satisfied to cook from a single recipe, especially for this blog. I research voraciously, comparing descriptions, ingredients, methods, photos, and any other information I can get my hands on, in order to turn out a more perfect what-have-you. You see, in my mind, I only have one shot at it, and I’d really rather not have to try a second time, or even think about the stupid thing again if I really dislike it. The research phase is crucial to me, no matter if I’m making croissants or pimiento cheese sandwiches. I need to know, before I get into it, if what I’m doing is okay, and I like to have some assurance of success for my efforts. This is where I went wrong with ensaïmadas the first time around. They came up in the middle of a busy week, I had unearthed what seemed like a nice enough recipe, and so I neglected the research part before baking them. Imagine my chagrin when a minute’s search, whilst writing the post, revealed that what I had made were surely fine little pastries, but were certainly not ensaïmadas. Real ensaïmadas, as made in Mallorca, are thinly-rolled rounds of dough, coated with lard (oh, yes), rolled up, spiralled, and baked into a laid-back version of a croissant. Flaky is a key word here, and my original attempt hadn’t a flaky bone in its body. Writing fancy prose about them soothed my wounded pride, but it couldn’t erase those silly rolls that had been thrust, aghast, out of sight into the recesses of the freezer. This time around, I was determined to correct my hasty oversight. I learned what they were, inside and out, and I was resolved to making a decent ensaïmada, come hell or high water. The only deviation from a truly authentic recipe was the substitution of butter for lard, which was purely out of necessity. I’ve no clue where to buy properly rendered lard, and I wasn’t about to render my own, as much as I devote myself to this project. And forget those tubs of hydrogenated lard in the “International Foods” aisle; you might as well use Crisco. I understand that many Mallorcan bakeries are now making them with butter, much to the dismay of purists, so I felt secure with this substitution. As it turned out, the dough I had was nearly spot-on, it was the method alone that needed tweaking. Rolling the dough out as thinly as possible is key to getting the flakiest ensaïmadas; these are made individually, no larger than a biscuit, and are quite flaky, but for the absolutely flakiest version, you can roll the dough out into one giant round, spread with all the butter, and make one huge ensaïmada instead. 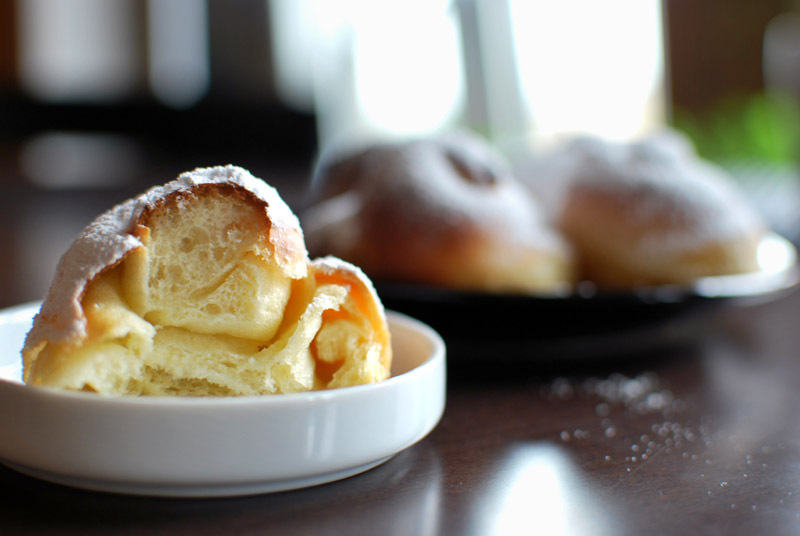 These gorgeous little pastries end up with a fantastic flavor, buttery and lightly sweet. The honey-colored crust is just barely crisp, and flakes away to reveal an incredibly tender interior. Need I tell you that the center is the softest and most delicious bite of all? I didn’t think so. 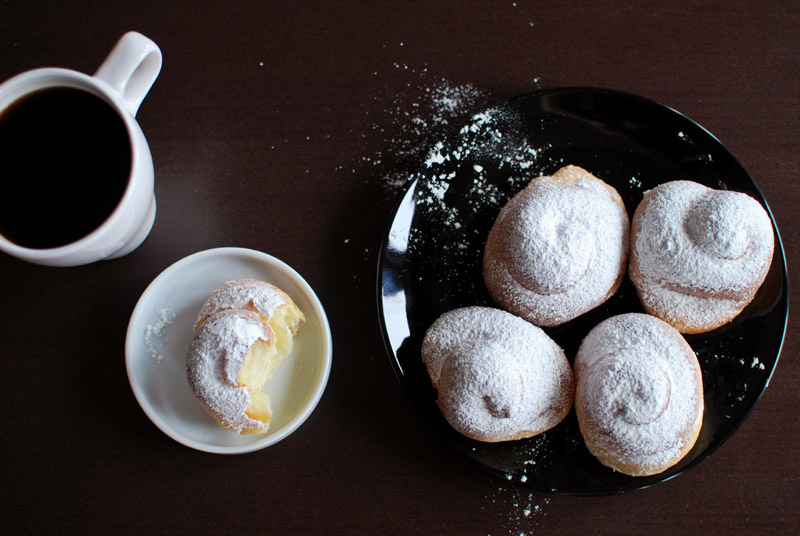 Served with a cup of good and strong coffee, the only worries you’ll have are keeping the powdered sugar from snowing all over your clothes. Success? I should say so. 1. In the bowl of a stand mixer, whisk the egg until well blended. Add the milk and olive oil, and whisk until combined. Add the flour, sugar, salt, and yeast. Using the dough hook, mix at low speed until all the flour is moistened and a rough dough forms. Increase the speed to medium-low and knead for about 5 minutes, or until smooth and elastic. 2. Transfer the dough to a lightly-oiled bowl, cover tightly with plastic wrap, and let sit at room temperature until nearly doubled in size, about 1 to 1½ hours. 3. Turn the dough out onto an un-floured work surface. Knead a few times to deflate, dusting lightly with flour as needed to prevent sticking. Divide the dough into 16 even pieces, form each into a round ball, cover loosely with plastic wrap, and let rest for 5 minutes. Line a large baking sheet with parchment paper. 4. Keeping unused pieces of dough covered, roll each piece of dough out into a flat circle, as thinly as possible, and dusting with only enough flour to prevent sticking. If the dough resists, cover and let rest while working on remaining pieces. The dough should be very thin. 5. After you roll each piece out to its maximum thinness, spread 1/2 tablespoon of the softened butter onto the surface. Roll up fairly tightly into a rope, and set aside, covered loosely with plastic wrap, as you work on the remaining pieces. When finished with all pieces, let all rest for 5 to 10 minutes. 6. Pick up each rope and gently pull to lengthen the rope slightly. Coil each rope into a spiral, on the prepared baking sheet. Tuck the tail end underneath. Repeat with remaining ropes. Cover loosely with plastic wrap, and let sit at room temperature until doubled in size, about 1 hour. Preheat the oven to 375º F.
7. Bake the spirals at 375º F for 10 to 15 minutes, or until golden brown. Remove from the oven and immediately dust with powdered sugar, ideally by sifting the sugar over the hot bread. Transfer to a wire rack to cool. Serve warm. 1. Ensaïmadas will keep at room temperature for about a day. They may also be frozen and reheated in a 350º F oven for about 5 minutes, or until heated through. I am glad to see you give it a second whirl, as the first ones definitely didn’t look right. Have you had an ensaimada in Mallorca before? If not, it’s virtually impossible to perfect a recipe that imitates them. 🙂 The picture depicted here looks like a sweet roll, not an ensaimada. As to ingredients, there should be no salt, milk or olive oil. It really helps if some starter dough is thrown in to help things along, and they have to rest into their design at least 24 hours, during which they should be kept moistened with water on the outside. Use a high gluten soft wheat baking flour (one geared for croissants or pastries) and work it until it is super elastic, and don’t be afraid to use an oily surface and hands to roll out and manually stretch them as far as they’ll go. Then rub a good amount of lard all over them before rolling into a snake and curling loosely into the basic form (they will grow to fill the gaps). Use the wrong flour, don’t get it as elastic as hand-thrown pizza dough, and skip the lard, and it’s not an ensaimada. Prairipridepork.com sells great lard. Hope that helps.